My hotel is just behind that capital building on the right. I mentioned some time ago that I was going to St. Louis last weekend for this year’s International Christian Retailers Show, where I was to be inducted into the inaugural Christy Awards Hall of Fame. They have decided to limit the number of awards an author can win to four, which is how many my books have won. Lynn Austin, a writer of historical novels who has won eight Christy’s, was also inducted. When I was first invited, I was hesitant to go. We’d have to board Quigley if both Stu and I went, which we’ve never done before with any of our dogs,. And I didn’t much take to the notion of going alone… I don’t care for fancy, dress up parties, and I really don’t care for being in any kind of limelight. Plus I feared I would fret about it for weeks and by that take away time otherwise devoted to Sky. I was almost ready to decline, but my agent Steve Laube talked me down off that ledge. It wasn’t that hard. All he had to do was point out what an opportunity it was to publicly thank Bethany House for all they’ve done for me and my books, and that turned it all around. Plus I got to publicly thank him for opening the door in the first place, and my editor Karen Schurrer who has had a significant hand in all my books. I am so glad I went. I had a great time, even if I did have to fly alone. (Primarily because long ago after a sudden glitch in our air travel plans I decided I would never again fly on the same day as the event I was attending.) So I left Sunday morning very early (the Christy dinner was Monday evening) while my husband stayed behind to bring Quigley to the Pet Resort Sunday afternoon. That way we could minimize the time Q spent there (we feared the worst). Stu left for St. Louis early Monday morning. Anyway, my hotel was practically at the foot of the Arch, and the dinner put on by Baker Publishing for all its authors, editors, publishing contacts and friends (Bethany House was acquired by Baker a number of years ago) was at the hotel next door. I’d also been invited to that, so at about five-thirty that evening, I left my room to walk over. On the way down some people in the elevator asked me if I was going outside. I said I was and they expressed head shakes of sympathy for my misfortune. I thought they were talking about the problem of the muggy heat and agreed with them that it was unpleasant. I told them I was from Arizona, as if that explained everything (we have that “dry” heat, you know, so the mugginess is always a shock). They seemed to agree, and got off on the second floor where the garage is. I went on down to the first floor, walked out toward the street and for the first time realized there was a thunder-and-lightning, pouring rainstorm outside that would rival many of the best monsoons of southern AZ. So that’s what the elevator people were talking about! I started laughing. Yeah, the humidity was about as bad as it could get! Well, when the rain didn’t let up, I went back up to get my umbrella and emergency poncho, which the Lord had fortuitously supplied me a couple of weeks ago. Then when there was a break in the ferocity of the downpour, I walked over, shielded by umbrella and a poncho that felt more like a garbage bag, though I arrived none the worse for wear. My shoes and the bottom of my skirt were a bit damp, but nothing anyone would notice, and both would dry soon. The dinner was held on the top of the building, where glass panels formed part of the roof and we enjoyed a spectacular show throughout the evening. I love rain storms, especially when there’s lightning and thunder. Always makes me think of the power of God. In fact, everything about this trip just drew my attention to God over and over again. All the weeks leading up to it, whenever I’d start fretting, I got to practice turning it all over to Him, utterly and completely. For example, there was the problem of where to find an umbrella in the midst of June, when there is rarely a cloud in the sky, let alone rain. In fact we’d hardly had any measurable rain since February. Nor did I have a lot of time to go driving around from place to place. So I took it to the Lord. You handle it, Father. Not long after that, I had to go to CVS to get my eye-drop prescription refilled and while I waited I wandered about the store. Well, I’d barely begun when I “happened” upon the umbrella and the poncho both. Right there together, and costing a lot less than everything I’d looked at online at Target and Wal-Mart. The woman who checked me out looked at the umbrella and poncho and commented that I must be going to a rainy place. Well, certainly a place with more potential for rain than we have here right now. This entry was posted in Awards, My books, Publishing and Marketing, Travels, writing life and tagged Christian Publishing, Christy Awards, marketing, Quigley, Travels, writing life on June 26, 2013 by Karen Hancock. so excited to hear more about it – we need photo(s) of YOU!!! Outstanding! 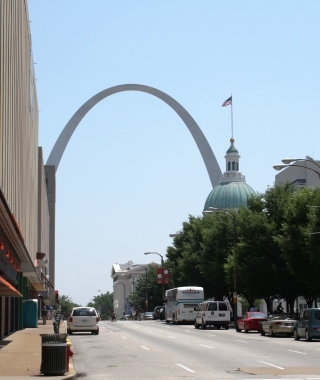 St. Louis is one of my favorite places and I’ve been there many times in the summer. This reminded me a great deal of so many of those trips. Cool! I did enjoy the city, what I saw of it. When we left we were both wishing we could have stayed longer to check out some of the many attactions. And the thunderstorm was really just a great addition to it all.